Our first try at describing what a Flying Lure does. 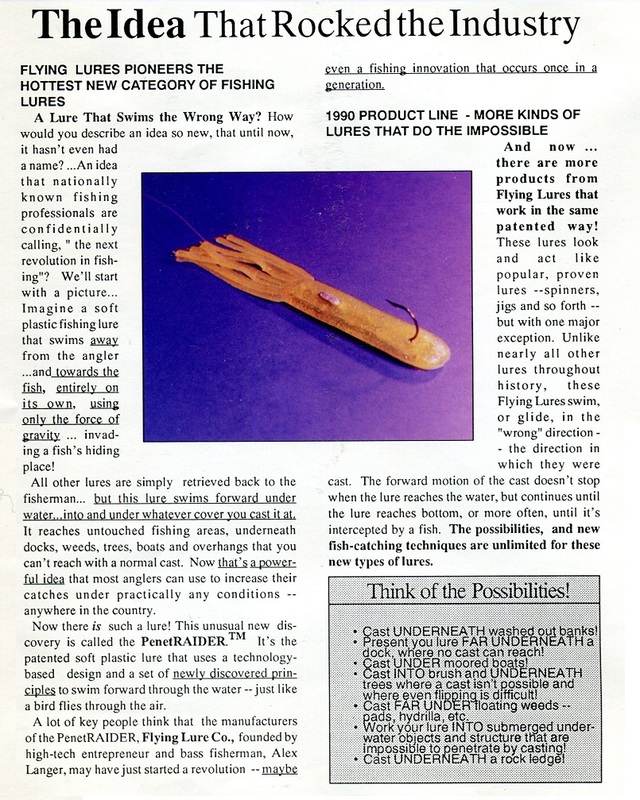 In our first catalog, we had to describe for the first time, what a Flying Lure actually does. Try doing that on any subject for the whole wide world to see sometime, even if you know the subject cold! It's a daunting task. We called the lure "the PenetRAIDER" at that time. Later we simplified it to the Flying Lure. We introduced way too many different lures at once in our first year. Besides the original Flying Lures, we announced spoons, spinners, spinnerbaits -- lots more baits than we actually needed, that I thought we absolutely needed that year. I remember still gluing some "Flying spoons and spinners" together in a Las Vegas hotel room that were already in our catalog, which existed only in my mind while hurrying to our small booth at the AFTMA national fishing trade show. The basic concepts are all the same. 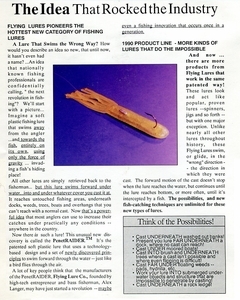 I later expounded on these points in my book, Flying Lure Fishing, which is available as a free updated e-book on this website.